Robyn Lana Choral Series | Santa Barbara Music Publishing, Inc.
Robyn Reeves Lana is the Founder, Managing Artistic Director and Conductor of the award winning Cincinnati Children’s Choir (CCC), Ensemble-in-Residence at the University of Cincinnati College-Conservatory of Music (CCM). Under her leadership, CCC earned a gold medal in the 2012 World Choir Games coming in first in the US in their category. She is also an adjunct professor at Xavier University where she directs the Women’s Chorus. Recognized for building tone, artistry, and independent musicianship in children and youth, Lana has been invited to present across the US and conduct international, state and regional honor and festival choirs. She has conducted an American Choral Directors Association (ACDA) Southern Division Honor Choir and international children’s festival choirs at Carnegie Hall in New York City and the Forbidden City Concert Hall in Beijing. 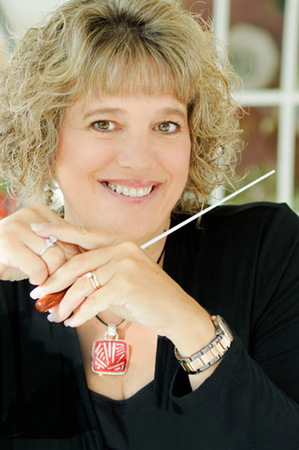 She is a founding director of the Queen City Children’s Choir Festival (Cincinnati, Ohio) and co-director of the Coastal Song Children’s Choir Festival (Savannah, Georgia and Charleston, South Carolina). Invitations to serve as conductor/clinician internationally include China, Italy, Japan and Malaysia. She has presented workshops for ACDA, American Orff Schulwerk Association, Chorus America, the World Choir Games 2012, National Association for Music Education, and Chamber Music America. Her choirs have been selected to perform for State, Regional, and National professional development conferences. Lana regularly prepares her choirs for collaborations with the Cincinnati Symphony, the Cincinnati Pops, the Cincinnati May Festival, Cincinnati Opera, and CCM choirs and orchestras achieving an extensive list of orchestral and operatic repertoire for children and praise from collaborating conductors including John Adams, Louis Langrée, John Morris Russell, Marcus Huber, James Conlon, Earl Rivers and Mark Gibson among others. CCC, under Mrs. Lana’s direction, can be heard on two Telarc label recordings with the Cincinnati Pops Orchestra under the direction of Maestro Erich Kunzel. Lana has published articles in the ACDA’s Choral Journal, Choristers Guild’s The Chorister, and Chamber Music America’s CMA Matters. She has served ACDA in state and Divisional leadership positions, as National Chair for Children’s and Community Youth Choir Repertoire and Standards (2007-2013). Lana is honored to serve on the Chorus America Board. She earned both Bachelor and Master degrees in Music Education/Voice from the University of Cincinnati College-Conservatory of Music and holds Level III Orff Schulwerk Certification.